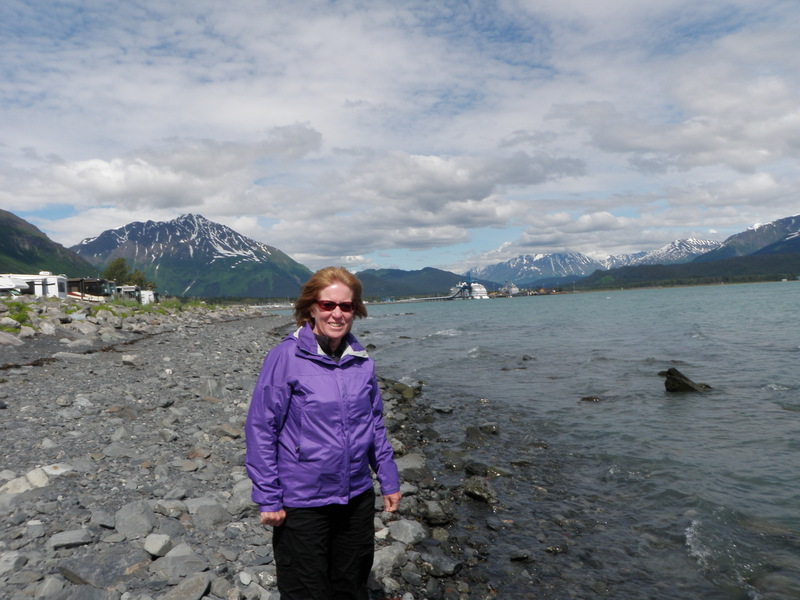 Wednesday was a travel day as Jane reserved lodging in Seward, AK. Seward was on the eastern side of the Kenai Peninsula south of Anchorage. We slept in a bit longer on Wednesday morning at our nice digs at the Agate Inn. The innkeepers left oatmeal and a few goodies for us, and then I ran into some other guests while taking things to the car. The couple was from Saskatchewan, and they had also driven to Alaska. I mentioned that there were supposed to be reindeer to feed but I hadn’t seen them, and the man told me we needed to go to the other side of the lodge through the lower level. 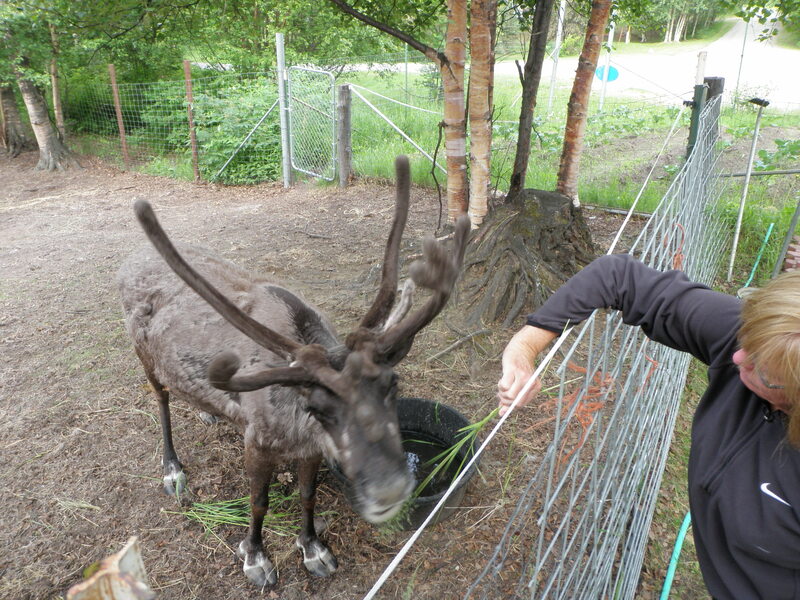 Jane and I followed his directions and sure enough there were five reindeer behind a fence on the south side of the house. We fed them some grass and carrots, and I snapped a few photos, and then we were on our way traveling south to Anchorage. We passed through Anchorage again and then traveled along Turnagain Arm on the same path we had driven Sunday night looking for wildlife. Captain Cook named this inlet Turnagain Arm because he mistakenly sailed up the arm only to realize it ended, and he had to “turn again”. As we approached Bird Point we noticed a nice parking area and a walkway to the point that juts into Turnagain Arm, so we stopped and took a brief walk and snapped some photos. 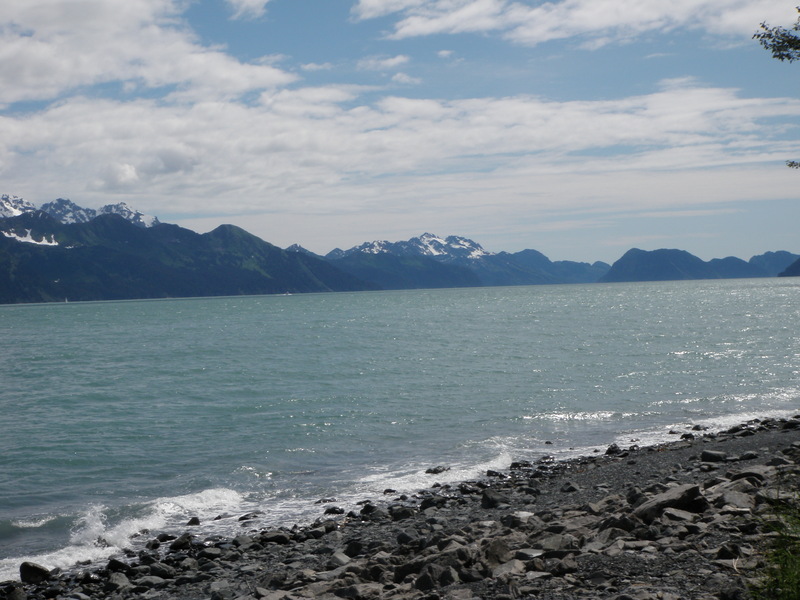 Once again we climbed in the car and after passing the end of Turnagain Arm, we passed the turn off that leads south to Homer and continued southeast across the Kenai Peninsula to Seward. This proved to be a very pretty drive with many lakes and evergreen forests and mountains. 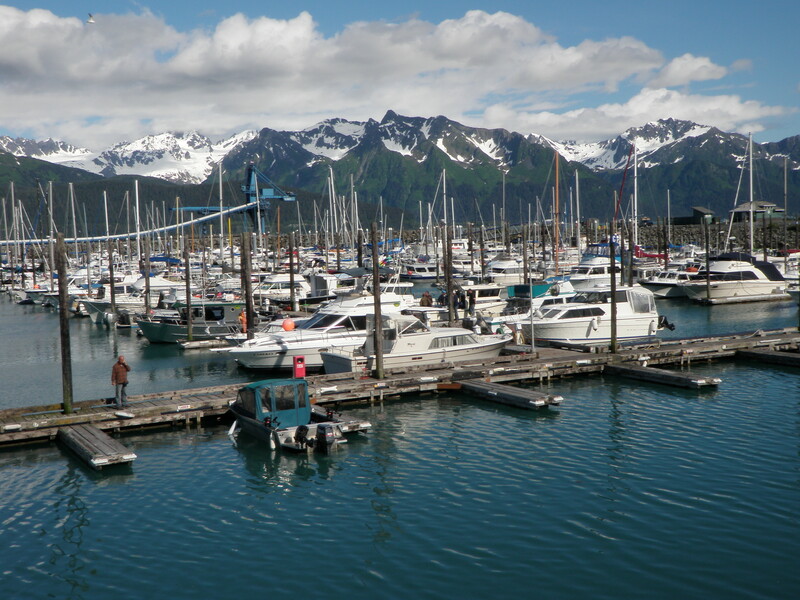 Finally we reached the picturesque seaside town of Seward, AK. First we found our hotel and checked in to our room. Next we drove down to the rocky beach and found a park with picnic tables and had our lunch. There was an area right next to the beach for RV’s and tents. After lunch we took a walk along Resurrection Bay and then looped back on the main business district and browsed a few shops. We noticed many tsunami evacuation route signs as Seward suffered fairly extensively from the 1964 earthquake and tsunami. Eventually we returned to our rental car parked near the picnic table where we ate lunch. 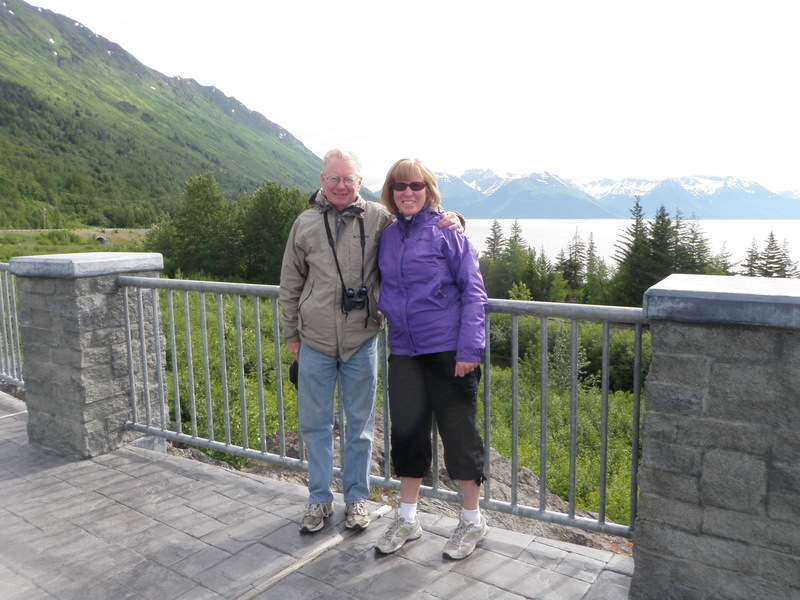 Our next adventure was to drive back out of Seward to the road that took us to Exit Glacier. 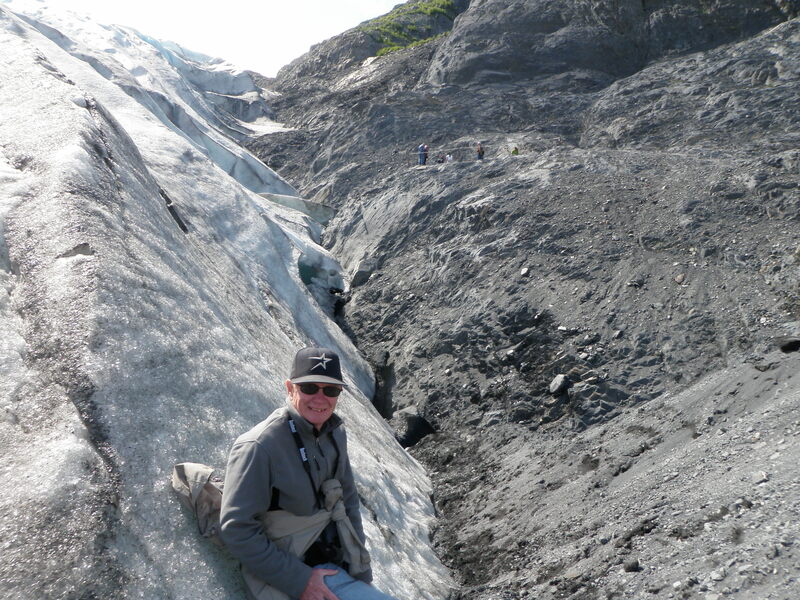 We parked in a fairly crowded parking lot and hiked the half mile or so required to reach the edge of the glacier. The glacier had many small dimples in its surface which made it look soft and slushy, but when I leaned against the thick edge I realized it was as hard as recently frozen ice. The information told us that it was moving approximately one foot a day and scouring the dirt beneath it. 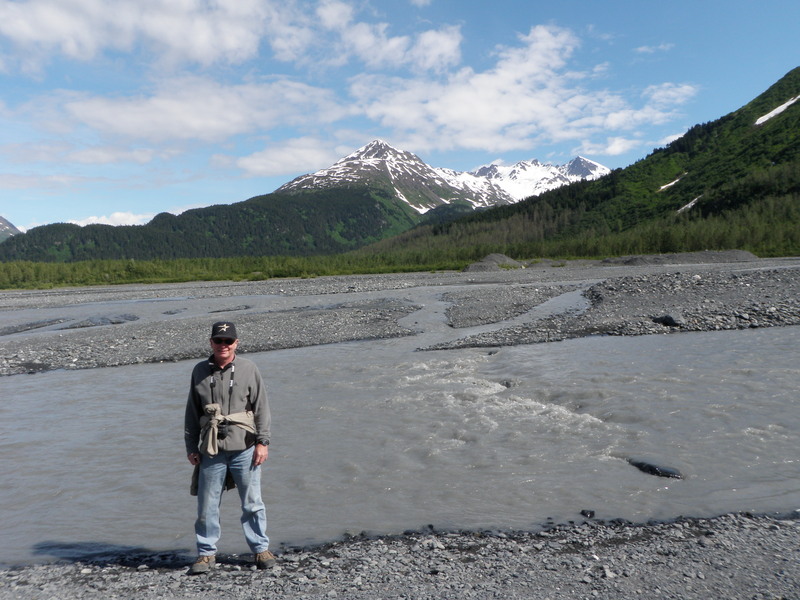 We hiked down the trail to the outflow and observed the dark gray water flowing from the melting glacier. 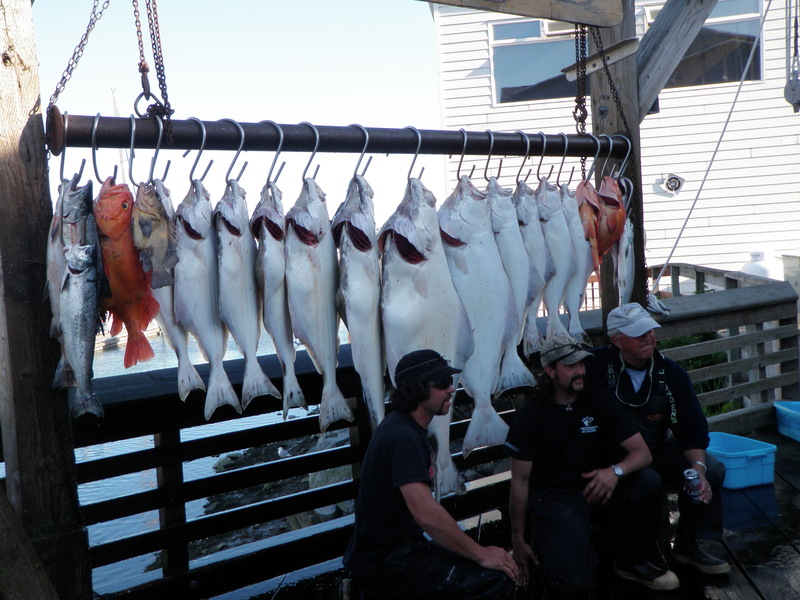 We returned to Seward and decided to investigate the Kenai Fjord cruise trip for Thursday and also check out the charter fishing boats. The cost of the Kenai Fjord cruise was $180/day, and we could select the cruise ship or the catamaran. The catamaran left later but traveled faster; however, it still returned later in the afternoon. We chose the cruise boat as it left earlier, but returned in early afternoon and reserved space for Thursday. Jane and I both liked the atmosphere of the harbor area and walked down the docks between the moored boats then circled back on the street that runs along the water. By now it was dinner time and we liked the idea of eating in one of the many restaurants located in the waterfront district. We had our eyes on a place called Chinooks, so we entered and were seated at a table on the second level overlooking the boats and the fish cleaning tables. Since I was at the Rainbow Point Lodge for our anniversary, we decided to make this our anniversary dinner and splurged on seafood medleys that contained salmon, rock fish, mussels, and crab. Meanwhile we were mesmerized by the activity around the fish cleaning tables and the guides removed fish after fish from the wheelbarrows and threw them up on the tables and filleted them. Jane asked me to time one of the men, and it took him eight minutes to clean a huge halibut. After dinner we went downstairs and gazed at the returning fishermen and their guides as they hung their catch on the board of hooks for all to see. We located the booking office for the fish charters and discovered this was a fairly expensive proposition. The Kenai Fjord tour was probably our best choice. This entry was posted in Alaska, Travel by wellerfish. Bookmark the permalink.